Fish pie essentials include leftover cooked fish mixed with bechamel sauce covered in creamy mashed potatoes and baked in the oven. For a deconstructed fish pie on the other hand the chef prepares the dish so that the main ingredients are cooked and put on the plate individually. The eater can see and taste what the “pie” is made of and savour the components in various combinations. The trick is to ensure that the flavours blend, as they would if the whole thing were baked — as a whole. To make a deconstructed fish pie I place quality small potatoes along with onions and/or other soft vegetables in a cast iron pot with a heavy lid on a very low heat on top of the stove. I add a bit of olive oil to prevent the ingredients sticking to the pot before the liquid has a chance to form. The soft vegetables give up their liquid (sweat) quickly, which serves to steam the potatoes. While the potatoes are steaming I put a couple of pieces of cod in foil into a pre-heated oven. After the potatoes have been cooking for about 10 minutes I sprinkle with some low-salt vegetable stock powder and paprika to enhance the flavour and texture of any water from the vegetables. I also throw in a handful of frozen peas and some herbs at this stage. For a pseudo-bechamel sauce I simply mix a desert spoon of cornflour (corn starch) in with milk and heat it up in a small saucepan, stirring and adjusting quantities until thick, adding dried parsley and grated Parmesan cheese. Add juices from the fish and some of the liquid from the vegetables. The sauce should end up a bit gelatinous so it lands on the plate as a blob when served, rather than a puddle. The main thing is to ensure the potatoes are cooked, after which they can be treated to a token mashing — just smashed around a bit. The cooking time for the whole ensemble should be under half an hour. I plate up into pasta dishes to help contain any residual liquid. This also adds ambiguity — is it a pie, a casserole, a soup, fine dining, health food, an experiment, an authentic regional Italian dish, a plate of leftovers? — and takes the pressure off trying to arrange the ingredients a la nouvelle cuisine. It’s also good to have a jar of tartare sauce, and horseradish sauce close to hand in case the dish needs pepping up, and put (real) butter on the table in case anyone notices its lack in the bechamel. With bowls of quartered lemons, rough chopped boiled eggs, grated cheese and salad on the table, the eaters may feel they are responsible for what’s on their plates and won’t blame the cook for any shortcomings. (You know the meal needs help if the guests start to commend you on the quality of the chicken.) The cook is of course responsible for the timing, and delivering hot food to all participants on warm plates and at the same time. The great thing about home cooking is that there’s no necessity to deliver consistency from one meal to the next, as in a restaurant kitchen. What you call “fish pie” today can be different from that to which you ascribe the label the next time round. The home cook just needs a repertoire of names to attach to whatever comes out of the oven — fish surprise might also do in this case. It’s essential also to have a repertoire of remedial measures to make food presentable, as well as flavoursome. (I believe Michelin star chefs pour tomato ketchup into casseroles.) I keep an icing sugar sprinkler filled with corn flour next to the stove, to dust over and stir into watery dishes to turn moisture into something like a sauce. The aforementioned powdered stock also comes in handy, as does paprika, which also thickens liquid when brought to the boil. It also adds texture, colour and flavour when sprinkled on baked, grilled or fried fish. It’s a philosophical commonplace to remark that the culinary and other popular uses of the word “deconstruction,” as used here, are in error. Exposing the components that make up a fish pie, or breaking it into parts, belongs simply in the category of good old-fashioned analysis, as outlined by the Rationalists (e.g. Rene Descartes). Analytic or reductive fish pie would probably be more accurate, were it not that those terms carry other connotations in the world of food. 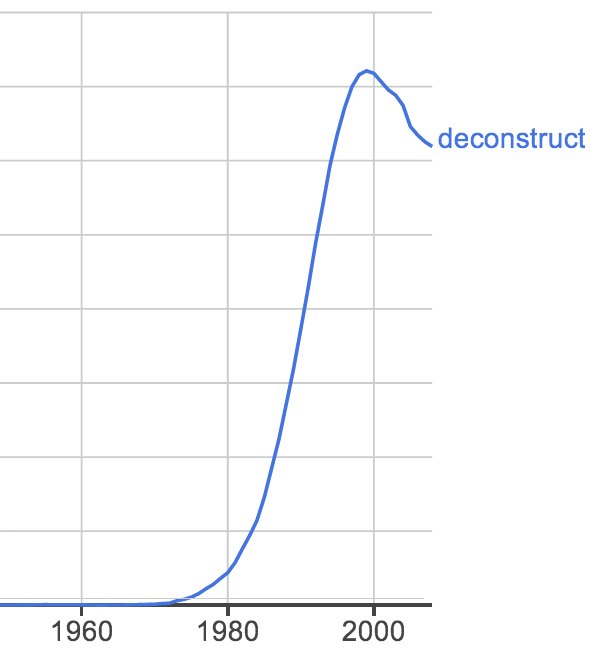 Google N-Gram showing the relative frequency of the word “deconstruct” in its extensive index of books. Deconstruction entered the world’s lexicon in the 1960s via Jacques Derrida. Deconstruction is a tactic in argumentation that attacks that which the author of a philosophical text holds most crucial to her argument, thus demonstrating how the argument undermines itself. As the field is philosophy, the target is usually a topic of consequence — not an argument about whether cod is best baked or grilled, but rather against those who might assert the priority of humans in the food chain, or the superiority of the natural over the artificial, or the evolutionary superiority of humans over other animals, or that there’s ever a final arbiter in matters of morals — that sort of thing. Derrida introduced the term “deconstruction” in his book Of Grammatology where he asserted that the apparent rationality of a text brings about the “destruction, not the demolition but the de-sedimentation, the de-construction” of its own argumentation (1976, p. 10). The term ‘Deconstruction’ clearly presents in opposition to concepts of construction, or at least, structure. As well as the structure of fish pie, there’s obvious resonance with architecture, and early examples of deconstructive architecture showed up as buildings in which the structure was exposed. Structural elements such as beams, stairs, windows and doors were “misplaced” and misaligned (like the fish pie ingredients). But the most direct reference from Deconstruction is to Structuralism, the highly influential movement in language and cultural theory. Structuralism developed its theories around the idea of oppositions in language and in culture generally: centre-periphery, raw-cooked, master-slave, writing-speaking, human-animal. There’s no time to say much more here, but in a nutshell deconstruction takes an accepted opposition and the priorities that entails and subverts them in some way. In the visual and sonic arts this tactic moved out of the realms of philosophical argument and became something akin to bricolage and what the Surrealists did when they put on anvil with a hat stand on an ironing board — it’s the provocation that comes with looking at something awry, the unusual juxtaposition, the strange context for the familiar object. I was alerted to the cooking theme when I stumbled across a thread on a culinary forum dedicated to the question of what deconstruction means (eGForums: Society of Culinary Arts and Letters). One astute contributor (Moopheus) said that true deconstructed cooking is where the chef gets waited at table while the paying guests spend the evening in the kitchen. So perhaps the impulse to deconstruct reveals itself in the kitchen after all, when fish ends up as chicken, the amateur talks like a food writer, the household eat baked beans while watching Come Dine With Me and Masterchef, what’s on the plate is an amalgam of Internet recipes that match what’s in the fridge, meals have as much presence as Instagram and Pinterest allow, and restaurants serve their wifi with a side of pie. See Pedro Rebelo’s sound piece: Culinary Belfast.